Jessica Sajovie is originally from Cleveland, Ohio, but is currently a London-based writer responsible for Diverting Journeys, a blog dedicated to irreverent reviews of museums and other curious destinations around the world, particularly (due to a limited travel budget) those in London and Southeast England. In addition, she volunteers with a local history project, researching the First World War and its impact on Merton. Jessica holds an MA in Early Modern History from King’s College London, with a focus on 18th century Britain and the history of medicine. Her other interests include collecting vintage cookbooks and Pez dispensers shaped like American Presidents, a never-ending quest to find blueberry cake doughnuts in London, and reading books on ill-fated maritime expeditions and lurid titles picked from the historical “True Crime” section at the library. She also enjoys classic rock. Though I’m keen on almost all museums (the possible exceptions being particularly dreary local affairs, or anything sport-related), medical museums are a particular favourite of mine. Over the past few years, I’ve blogged about a number of them around Britain (the Gordon Museum of Pathology, the Royal London Hospital Museum, Dr. Jenner’s House , the Royal Berkshire Medical Museum, and many others, if you feel like digging around my blog), and elsewhere in the world (even in places as far-flung as Thailand) but being a homebody at heart, I was excited to discover that a new medical museum had opened right on the outskirts of London – the former Bethlem Hospital Museum, which was recently revamped and re-opened as the Museum of the Mind. 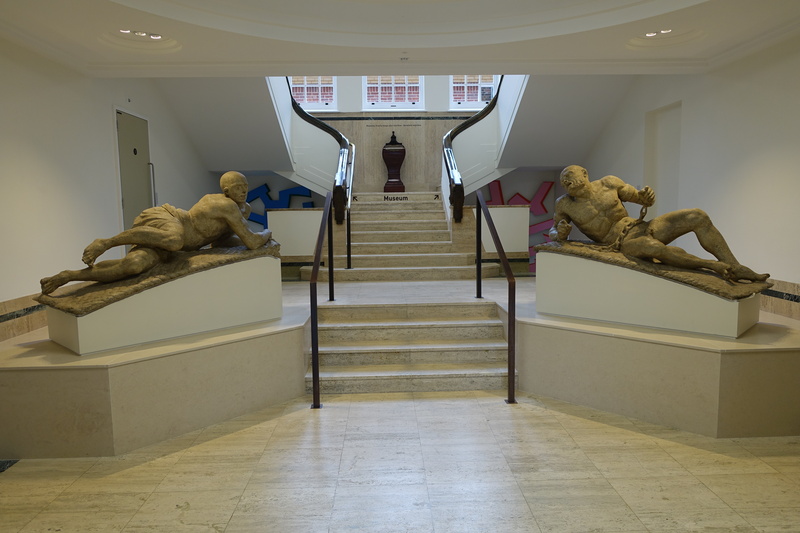 The entrance of the Bethlem Hospital museum in London. Bethlem Royal Hospital has been around in one form or another since AD 1247, making it the oldest mental hospital in Britain (although it started strictly as an almshouse, and only began to be used for mentally ill patients in the early 14th century). It was initially located in Bishopsgate, just beyond the old City of London, but was moved to Moorfields in the late 17th century, which is around the time it began to acquire its tumultuous “bedlam” reputation (the name of the hospital had been shortened to “Bedlam” for centuries, but it was only in the 1600s that the word began to be used as a synonym for chaos), as the hospital encouraged paying visitors, and gawking at the “lunatics” became a popular day out for the wealthy. In 1815, the hospital moved again, this time to Southwark (what is now the Imperial War Museum), and due to a damning report about conditions in the hospital, Bethlem gradually developed more humane treatments for its patients, and put an end to the sight-seeing. 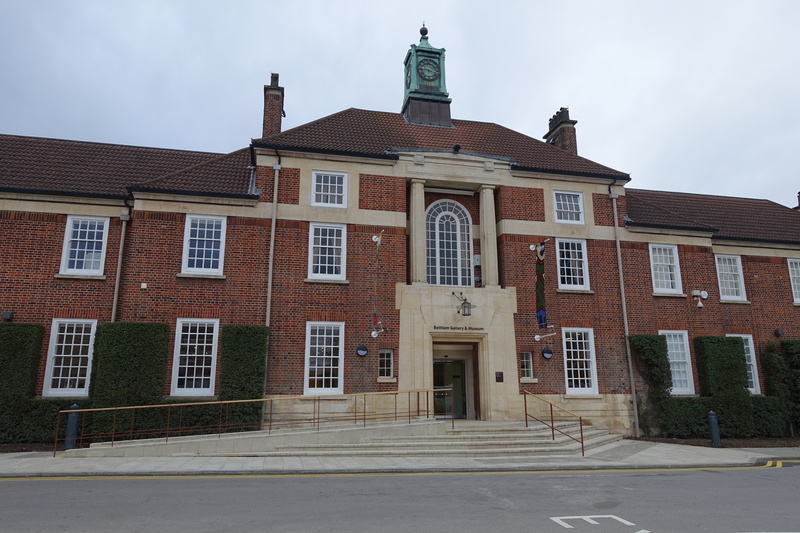 Finally, in 1930, Bethlem moved out to its current location, in Kent, where the museum is located today. 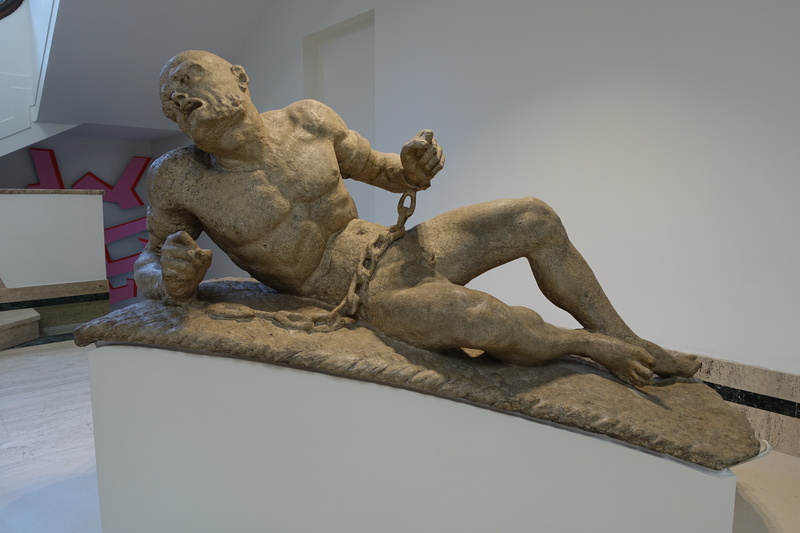 A detail of one of the entrance statues by Caius Gabriel Cibber in the museum highlighting the representation of mental illness via the shackles. This is a continuing theme at Bethlem Hospital as shackles and chains were often previously used to subdue patients. Firstly, some practicalities. The Museum of the Mind is not too far from Croydon, so most Londoners should be able to make their way out there using a combination of trains and buses (or the tram from Wimbledon…if you don’t hate it as much as I do; ugh, it’s so slow, and the unfortunately named “Therapia Lane” creeps me out). I chose to travel by car, which in retrospect may have been a mistake as it took about an hour to get there from Southwest London, but at least there was ample parking in the visitor lot at the hospital, which is a short walk away from the museum (and I had the freedom to sing along (poorly) to all my favourite classic rock songs in the car, which I wouldn’t have been able to do in the tram without getting weird looks). The museum is normally open Wednesday-Friday, and the first and last Saturday of the month, and admission is free. A patient’s creative representation of mental illness. My first impression was that it was like a small-scale Dr. Guislain Museum (a fabulous museum in Belgium that is located in a working mental hospital and provides a comprehensive history of psychiatric medicine, in addition to art galleries featuring works by people suffering from various mental illnesses), as it incorporated both museum space and art galleries with works by some of its service users. I started with the gallery space on the ground floor, which was compromised of two rooms: a display area and a workshop whose walls were also lined with pictures. A two or three paragraph description was provided for each piece; I particularly liked an artist with a penchant for photographing crows. The workshop seems to be frequently used for various classes, as there was one starting up when I was in there viewing the art (and purchasing a Dan Duggan print), and since I was asked if I wanted to join the class (which I awkwardly declined, as I didn’t have time and totally lack artistic talent anyway), I assume at least some of them are offered free of charge. The stairwell leading up to the first floor is flanked by the famous statues Raving Madness and Melancholy Madness (by Caius Gabriel Cibber, father of the much-maligned Poet Laureate Colley Cibber, though I have to say Alexander Pope’s constant mockery of the younger Colley livened up the 18th Century Literature classes I took in my undergrad days) which stood atop the gates of the late 17th century hospital, and truly demonstrate Restoration-era conceptions of madness, as the faces of the figures are so contorted that they scarcely look human. Raving Madness and Melancholy Madness by the artist Caius Gabriel Cibber at the 1st floor stairs in the museum. There’s also an old donation box where visitors back in the sight-seeing era of Bethlem’s history were encouraged to leave money (although the treatments at the hospital have radically changed, the box is still in use for its original purpose, and they gladly welcome any donations). The first floor is divided into a museum and another art gallery, which hosts temporary exhibitions. 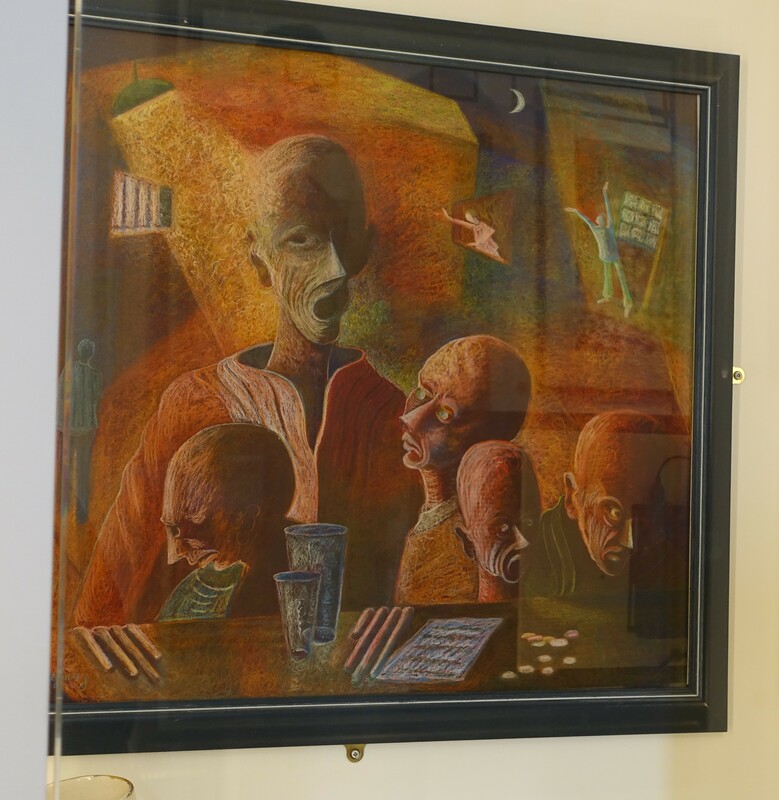 The one I saw, which ran through May, featured the paintings of Bryan Charnley, who had schizophrenia, and “use[d] visual metaphor and symbolism to vividly illustrate the physical experience [of schizophrenia]” (taken from Bethlem’s website). Many of his paintings featured his girlfriend, who struggled with depression herself and attempted suicide multiple times, eventually resulting in her paralysis, and thus the overwhelming impression I had of his art was one of poignancy. A Bethlem Museum of the Mind poster set in the historic hospital grounds. The actual museum is fairly small, and is split up into several sections. 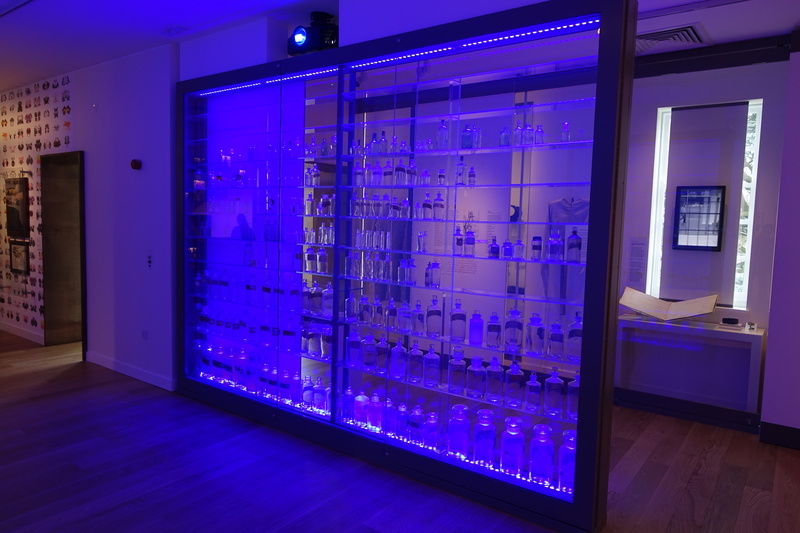 Unlike the Dr. Guislain Museum, this was far from a comprehensive history – being more a brief overview of changing attitudes towards mental illness over the years, and the ever-evolving treatments at Bethlem, as well as providing some perspectives from some of its service users. The museum does make an effort to draw in the visitor by including lots of eye-catching displays (like a wall full of apothecary bottles) and a few interactives (some videos, and a computer where you could learn more about various diagnoses), but it wasn’t as interactive as one might expect from a brand-new museum, and the displays weren’t quite enough to distract me from the lack of content. A detail of the various concoctions and medicines used in the course of treatment for the individuals who stayed at Bethlem Hospital. That said, I found the small collection of restraint devices used in the past fascinating, albeit disturbing, and I was also captivated by the before-and-after photographs of Victorian patients at Bethlem (the historical signifier of insanity apparently being unkempt hair, if these pictures were anything to go by). I believe the hospital had something like a 47% recovery rate in the Victorian era, though with the lack of effective medication, you have to wonder how many of those “recovered” people should have even been placed in Bethlem in the first place (given the Victorian zeal for labelling anyone who didn’t quite adopt society’s mores as “insane,” I would imagine it was a fair few). This section also contained even more art from former patients, and although many pieces were quite gloomy in nature (perhaps understandably reflecting the mental states of the artists), I was charmed by the many cat paintings of Louis Wain, who was briefly a patient at the hospital (his diagnosis is widely disputed, and is listed as anything from schizophrenia to Asperger’s…all that is really known is that he suffered from mood swings and was occasionally violent, although you really wouldn’t know it from his cheerful pictures). Fortunately, postcards of his pieces are available at the gift shop (because everybody loves cats these days, right? ), so you can take a little piece of Wain’s art home with you. 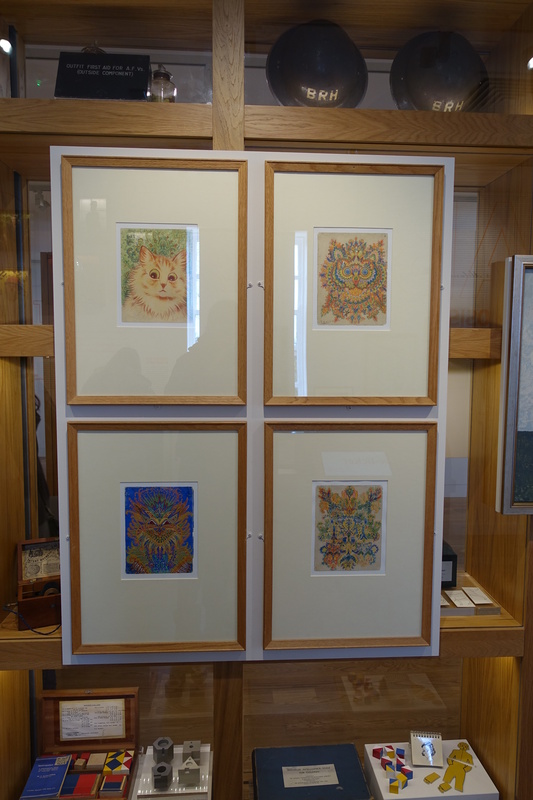 A small selection of Louis Wain’s cat pictures. Although I could tell that a lot of effort had been put into making the museum visually appealing, I do think it just needed to have more content. The historical objects were my absolute favourite part, and I think the museum could be vastly improved by including more history, and more artefacts, because even though many historical psychiatric treatments are hard to stomach nowadays, they are a vital part of our past, and I think it’s really important that people learn about them just to see the strides medicine has made within the last century or two. Although they offer classes and lectures, and the art displays do change from time to time, for me, one visit here was enough, as it just wasn’t extensive enough for my tastes, and didn’t really add anything to my understanding of psychiatric medicine (even the history of Bethlem itself was lacking, with more detail provided in a timeline at the top of the stairs than in the museum itself). I really think the focus here was on the art, so if that interests you, you may enjoy the Museum of the Mind (and some of the artists were very talented, so their art was well worth seeing), but if, like me, you’re looking for something that skillfully combines history with some art, then I’d urge you to go to Ghent (if you can) to see the Dr. Guislain Museum, as it goes into so much more detail. 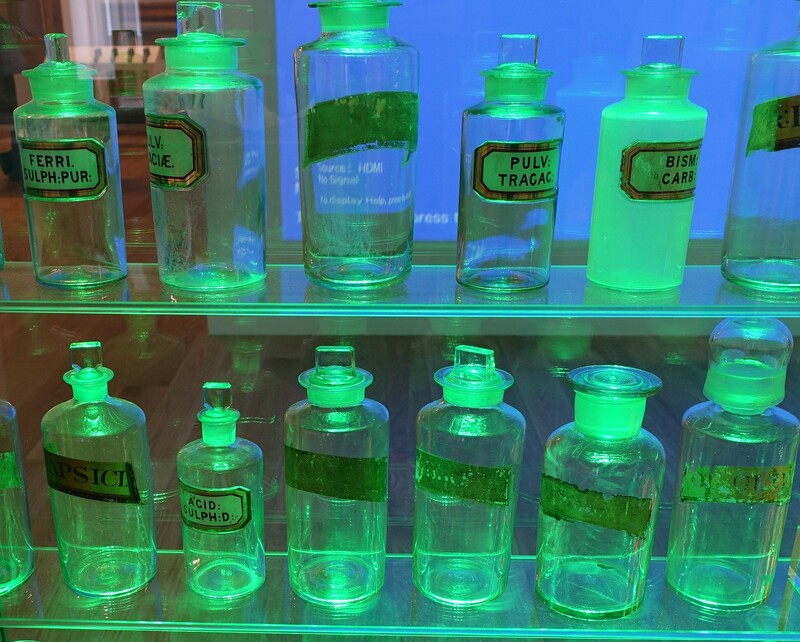 A selection of the vials and bottles that the hospital used to store and use in the medicine collection. In conclusion my score for the Museum of the Mind is 2.5/5 (and if anyone knows of a better mental health museum in Britain, please do let me know in the comments!). All photographs in this guest entry are by Jessica Sajovie, if used elsewhere please contact Jessica on her personal blog for permission. 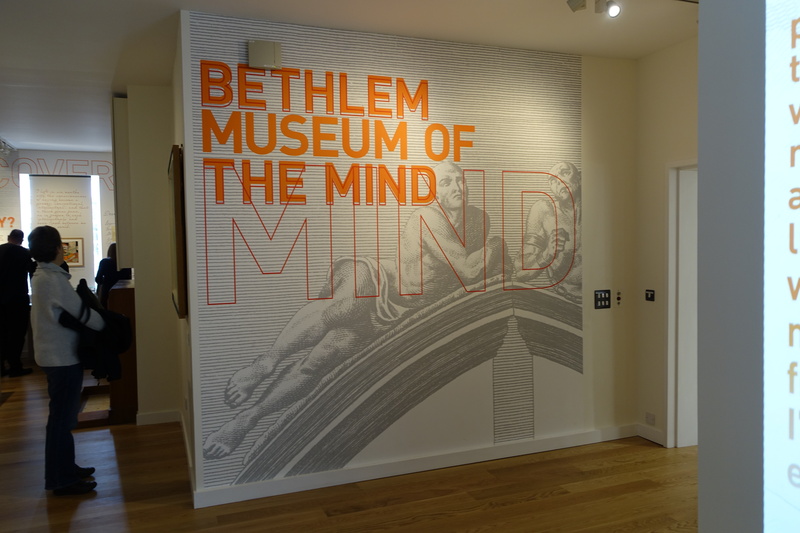 The Bethlem Museum of the Mind details the story behind the museum and the role that the hospital played in its own history. The site also highlights upcoming exhibitions and the collections that it holds (including the wonderful artwork produced by some of the patients and its archive). The museum blog, with regular updates on both the exhibitions at the museum and issues that affect the museum, can be read here.